Microsoft (MSFT) roped in 400,000 Facebook fans for Bing in 24 hours via a promotion on Zynga’s insanely popular Facebook game FarmVille. 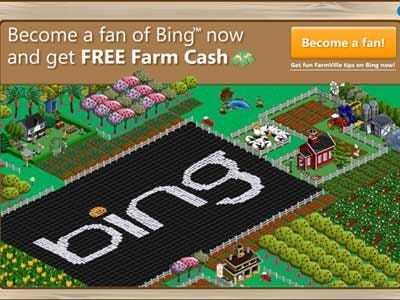 On Tuesday, the 28.7 million people who played FarmVille were presented with a Bing ad, pictured here. In exchange for becoming fans of Bing on Facebook, players received 3 “Farm Cash”, used to buy virtual goods in the game. 25 Farm Cash costs $5. On that basis, Microsoft handed out $240,000 worth of game currency, and almost quintupled its fan count, which now stands at a little over 570,000. Google currently has 525,000 fans. Microsoft has been spending heavily on Facebook and elsewhere to grab search traffic, but its marketshare is still tiny. Having the most Facebook fans is hardly a huge coup, but in this one small way, Bing’s footprint is now bigger than its rival’s, and the move presumably didn’t cost them all that much.